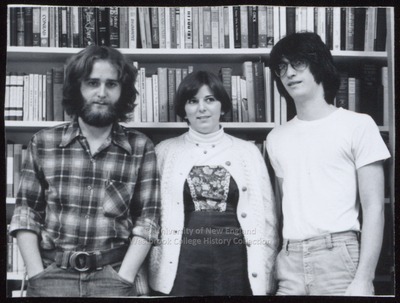 "Three Students at Library Bookshelves, Westbrook College, 1970s"
Three Westbrook College students pose before library bookshelves in this 1970s black and white photograph. Two young men stand on either side of a young woman. The female student wears a jumper with white turtle neck jersey beneath the jumper and a white cable knit cardigan sweater over it. The male students wear jeans--one with a plaid flannel shirt, the other with a plain white t-shirt. Both young men have long, shaggy haircuts. The one on the left sports a full beard and side-burns.